"For if the dead are not raised, then Christ has not been raised either." I want to focus on one of the implied truths in this verse today. In discussing the fact that Christ has been raised, this verse implies that Christ died. This is a huge idea. This is an idea we should have trouble wrapping our minds around. And Paul is aware of this, in chapter 1 he repeatedly refers to his message as "foolishness." The story of the Gospel is wild. It's firmly in the "you can't make this stuff up" category. First of all, the Gospel story starts with a God that loves people who have consistently, almost obsessively turned away from him. Second, the way the story plays itself out is through God being born as a human baby, God living among people in a specific town with no special treatment or honor or reverence, and God being killed in the most shameful way that was reserved for the lowest of the low. To believe a story like this really is foolish. And this was a prevailing opinion in many circles. 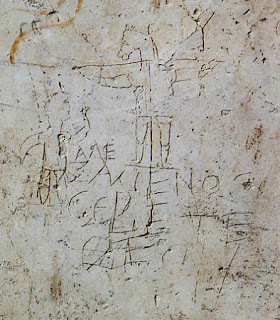 Pictured here is an inscription known as the Alexamenos graffito. It is basically ancient graffiti. It was found carved into the wall of a building excavated just outside Rome and scholars generally place it between the late 1st to early 3rd century AD. The picture depicts a man's body with a donkey's head being crucified while a human figure looks on in reverence. The text below reads, "Alexamenos worships his God." The meaning is vastly agreed to be disparaging towards a specific Christian believer named Alexamenos. The idea that someone's God of choice would be a man who was killed in the method reserved for lowly criminals and really the idea that his God could be killed at all was a point of mockery for the artist. On its surface, a religion that worships a God who died (whether or not He rose again) seems to be tearing down the ground on which it stands. But from the far side of the cross, this message truly is the power of God. The fact that God, the one true God, would come as a man, to substitutionarily take the place of bent, crooked, sinful mankind and pay their price on their behalf, resulting in physical death, is the power of God. It is the power of a God who's "foolishness is wiser than man's wisdom" (1:25). It is the power of a God who knew this was the only way to rescue humankind and bring them back into a right relationship with Him. It is a reminder that our "faith does not rest on men's wisdom, but on God's power." Disclaimer: This is not to be seen as an esoteric, "you have to experience it" argument. Nor is it meant to be a challenge to the value of human reasoning and knowledge. However, it is reality that the claims of Christianity come down to this: It's not an argument between people, the parties are not of equal standing, Man's reasoning and God's reasoning are the parties. And whether or not we choose to believe this God to exist, everyone has to and should wrestle with the questions of "Is this true?" and "If it is true, what does it mean?" From personal experience, I spend far too much time using my human capabilities and not near enough asking, "What has the God of the Universe spoken on this issue?"